Being a mother is one of the most important jobs we are given in this life, yet often times we feel as though we just aren’t doing as much as we can be doing for ourselves and for our children. 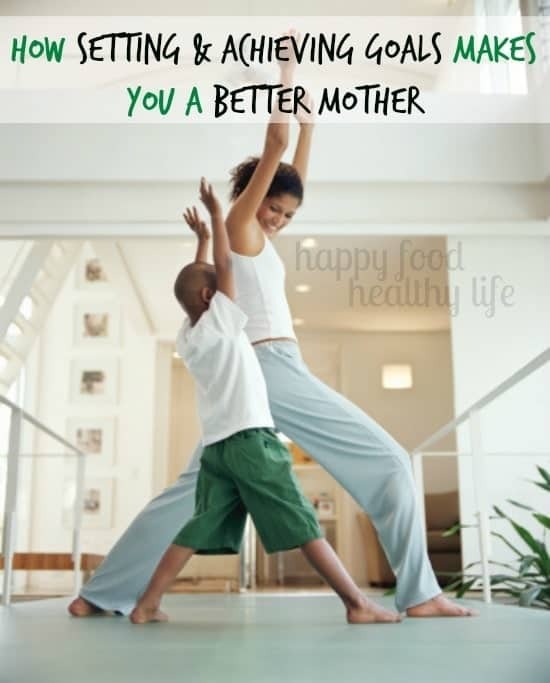 Find out how setting and achieving goals makes you a better mother. For me, when I became a mother over seven years ago, I feel as though I was handed this huge responsibility. I was literally in charge of another human being’s life! I was the one who would set the stage for the core values and beliefs in my son’s life, and truth be told, that was more than a little scary! Although, I felt as though this was my life’s calling, I was definitely apprehensive to take on such a huge job. I mean, this child would be a direct reflection of me. And well, there were some things about myself that I didn’t necessarily want to have reflected! When I very first became a mama, I can absolutely say that I was not the mom I wanted to be. I didn’t have goals. For me, that meant that life was mundane. The same thing every day. No real direction or drive. I wasn’t growing. I wasn’t achieving anything. The most important part was that my son was not being taught about goals and reaching towards anything. He didn’t know the worth or importance of working towards a goal and achieving goals that mean something to you. Now that I know what life looks like for both myself and my son when I’m not working towards achieving goals, the contrast of living in the complete opposite way is so great. The example that I set for my son is just amazing! Xander knows that I have goals for my business. He knows that they require sacrifices, and I truly do believe that he respects that more than he resents it. Instead of me just saying “Mama has to work on the computer for the blog,” I am very sure to break it down for him. I let him know that it’s not just a fun place to put recipes on, but that it’s something that could very well change our lives for the better if I continue to work towards my goals. Explaining things to our kids in this way really sets the stage for them to see that hard work really does pay off. Also, there is nothing more liberating than taking charge of your life. You know what you want, and you are willing to work hard to make it happen. Whether it’s a health goal, a business goal, or a personal goal, these are all things that we are able to work toward and take charge of. The confidence that we gain from being in charge will directly translate to our confidence in our roles as mothers. You know what’s really going to make you feel awesome? Getting those kiddos in on the action? How can they help you? As soon as you know what goal you want to work toward, tell them all about it. And tell them about all the steps you need to do in order to achieve it. Let’s say you really want to run a 5k. Tell them about this awesome race you are going to work towards. It’s going to take a lot of work in order for you to do it, but if you train often, eat right, and stay active, you know you can do it. Get them all excited about watching you cross the finish line. Or maybe they want to run along side you if they’re old enough! The more excited you get about it, the more they’re going to be on board to make sure you are working for it. And maybe there are ways that they can get involved in helping you out. If they’re old enough, they could train with you. Or they could help you make some healthy snacks. Let them see that they are helping you achieve something great that’s going to make you happy! Getting your family involved is really going to create a healthy family unit. You’re talking about goals. You’re all working towards your goals. The only thing left is to ask your kids (at any age!) what their goals are. The younger ones may need a little bit of help, but I’m sure you can help them come up with a goal to work towards and even a couple of steps that need to happen in order to get there. Make a fun chart or poster to really hit it home. By working on your goals, helping your kids reach their goals, and really working together towards self-improvement as a family unit, you are going to gain so much confidence in your mothering. So often, we just go through the motions of getting dinner on the table, folding laundry, and keeping a clean house that we sometimes forward to be actively involved in our kids’ lives. Using these steps to really help your children mold themselves into young adults, and eventually adults who will leave your home, is going to make you feel like a Rockstar Mama. I hope you see how setting and achieving goals, plus helping your kids set theirs, really brings it all full circle and helps you gain success. Maybe you’re still not quite sure how to go from setting your goals to actually achieving them. I know that can be the hardest part for many people. That’s why I created a simple little guide that would take you right from Point A to Point B, with no haze or confusion. Click Here to Learn More About Achieving Your Goals! It is so important to have goals and to be positive with children. When I have a goal, it automatically teaches my little ones how it works, what progress is made, and models for them what they can also accomplish. Thanks for a great post! And that’s the key to shaping these children of ours. Teaching them how to be successful at a young age. Cause and effect, perseverance, and dedication. Thank you so much for coming by!